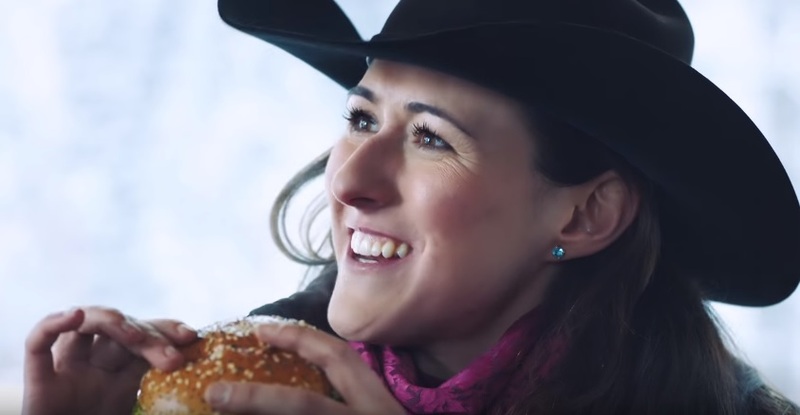 McDonald’s Canada is back in Alberta this winter to show that the Mighty Angus burger still holds up to its ‘mighty’ name. The new product was first introduced in Canada with a campaign offering the new burger to the cowboys participating at the annual stampede rodeo and get their mighty seal of approval. This time, those cowboys show us what they get up to during the winter months and introduce a little-known sport to the rest of Canada: Skijoring. Through a TV spot and digital videos we watch as cowboys are pulled on skis through courses and over jumps by galloping horses at speeds of up to 50 kilometers per hour. The campaign, developed by creative agency Cossette, rolls out on February 2 with a 30-second TV spot that visits a bustling skijoring course. After the cowboys finish impressive laps through hay bail slalom courses and snow jumps, they’re handed Mighty Angus burgers and certify the burger made of beef proudly sourced from Canadian farms, ‘mighty’. Two 15-second digital pre-roll videos were created to demonstrate the skijoring experience and engage viewers through the cowboy’s adventure, including one in 360-Digital format- the first time a Canadian brand is using 360 video within a YouTube TrueView ad unit. Viewers are able to experience the skijoring course through the 360-Digital video and can choose what angle they want to watch the video on any connected device. You can drag the video with a cursor on desktops and laptops or with a finger on any touchscreen. The Mighty Angus Burger was first launched in August 2015 and is the first new premium burger the Company has added to its permanent menu since 2012. The recipe was created with help from Canadian consumer taste-testers to get it just right. The Mighty Angus is made with carefully selected cuts of 100% pure Angus beef proudly sourced from Canadian farms enhanced with a smoky Angus sauce, and topped with hickory smoked bacon pieces, crisp leaf lettuce, tomato, processed cheddar cheese and grilled onions, all served on a sesame and poppy seed bun. The digital was developed by Cossette and OMD handled the media buy.